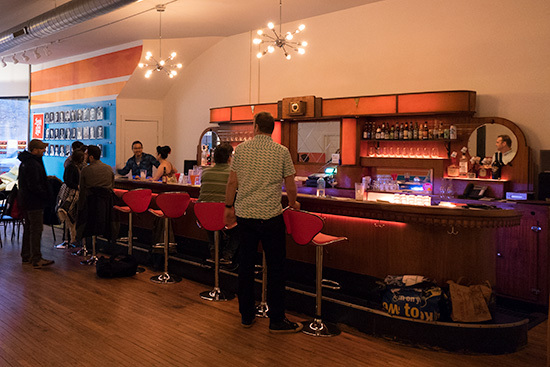 Our bar is originally from a public house in New Holstein, a small town in Wisconsin. 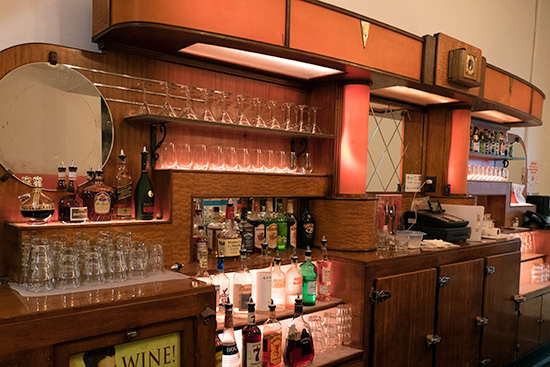 The place opened in the 1880s and installed this new bar in the 1930s. The establishment closed for good in 2004 and this deco 1930s masterpiece was rescued by a guy named Tom. It lived in his garage until he listed it on eBay, and Lillie & Scott bought it for a song in the fall of 2015. Seriously, the cost to ship it to Chicago was more than the purchase price. A dozen people who work at Laugh Out Loud showed up and stopped traffic on Lincoln to move this sucker in. The bar really needed some work: it was covered in formica and glue residue from carpet. Yes, someone covered the bar in carpet. It was restored to its former glory by Wilson Lema and his brother Milton, and new refrigeration was added to the center section. Please enjoy our signature drink and pretend prohibition just ended.